Born in 1965 in Morshansk, Russia. In 1987 graduated Penza Art College named after K. A. Savickiy, than in 1995 graduated Kharkiv Gesign Academy. Author's works are presented in private collections in Germany, Great Britain, Italy and Russia. Lives and works in Kharkiv, Ukraine. 2010 Once more about love, part 2, "AS" Contemporary art Gallery, Kharkiv, Ukraine. 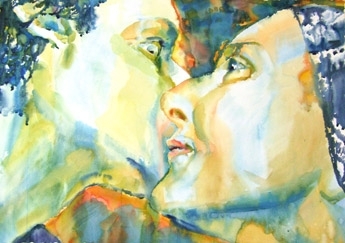 2009 Once more about love, part 1, "AS" Contemporary art Gallery, Kharkiv, Ukraine. 2007 Personal exhibition, LENIN art-gallery, Zaporihya, Ukraine. 2004 Kharkov-Perfect, Nuremberg House, Khariv, Ukraine.